Shipping costs are $5.99 per Package for all International Deliveries. We guarantee to process all orders within maximum of 24 hours after receiving cleared payment. You will never have to pay any Custom Duties as our products are not a subject of taxation. All shipments are Registered, therefore has a tracking number. Once the package reaches your country, you will be able to check its location. In case the package gets lost we will receive an insurance and you will be issued a full refund. 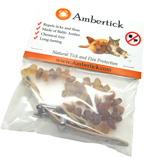 If you need custom packaging, please contact support@ambertick.com (additional handling fees may apply).